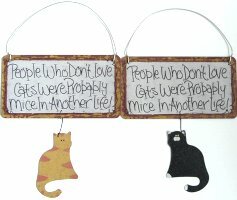 This metal cat sign spells out a "cat truth" - People Who Don't Love Cats Were Probably Mice In Another Life. The metal sign with the words is 7 1/2" wide x 4" high. The cat is 4" high x 2 1/2" wide. The wire hanger extends 3" above the sign. Only 2 of tuxedo left. The orange cat is sold out.